The Tax Policies and Local Budgets Directorate is performing the „Development of the Informational System architecture and the economical-financial database structure for the authorities of the local public administration – BDAPL, SMIS code: 2984, valued at: 3.743.000 lei, the first from a suite of 3, the others being estimated at around 29.761.000 lei, respectively 4.250.000 lei, with the project team consisting of 8 persons. The total value of the projects will consist in 37.754.000 lei. Currently, in Romania, the local authorities are operating in 3228 administrative-territorial units, organized at the level of: 2861 communes, 217 cities, 103 municipalities, 6 districts and 41 counties. The diversity and the specificity of each of them do not allow an uniform treatment in terms of population, and the analysis must take into account the criteria such as landforms (mountains, hills, plains, deltas, coastal) and the social-economic development of the regions and areas located in. For example, in Romania there are a number of 12,956 villages, of which 469 villages belonging to towns or cities. The main problem of the Romanian public institutions, as it is presented in Chapter 11 regarding the administrative Capacity of the National Development Plan, is represented by their management, which is a political one, neglecting the importance of planning and strategic management as management tools. 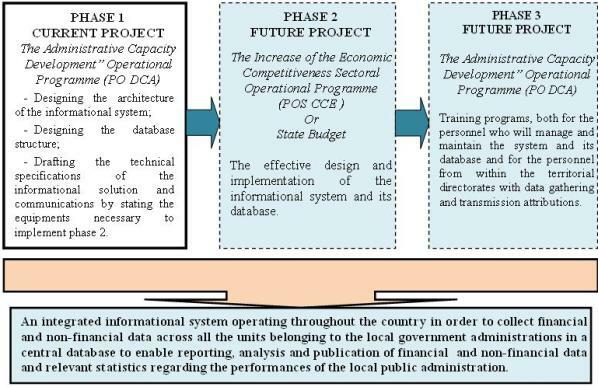 After analyzing the current situation of the public administration in Romania, the Government has identified the need for intervention as a priority area, streamlining and strengthening effective decision-making processes, namely to achieve an efficient management through the Administrative Capacity Development Operational Programme (PO DCA). Many of the decisions of the central government administration, aiming at the decentralization processes and local fiscal and budgetary policies are based on incomplete and irrelevant information across the local government administration, which generates decision making activities under uncertainty conditions and even risks. This situation leads to subsequent congestions and the need for additional decisions in order to correct the initial decisions and to optimize them. Currently, the information is scattered and partial in many central public institutions, being filtered and altered by aggregation at county or national levels. Very often, within the discussions carried out during consultations between different central government institutions, contradictions generated by different draw conclusions based on their respective data occur. In fact, based on each institution's own data analysis they apparently reach fundamental conclusions, however, the starting point is different in terms of content, structure, indicators, and their conclusions differ from others. Opinions are also adjusted by consulting with the association structures of the local government authorities, but also they have the same problem as the central government administration, respectively regarding the foundation for carrying out the analysis activities. Making local tax policies and budget policies for the local government reform consists in making analysis and simulations in order to identify and to make decisions under certain conditions. To properly apply the financial balancing system, the collection of economic and financial data in each local government units in order to enable the generation of relevant indicators is required. At the same time, it is necessary to conduct a regular monitoring in order to capture the developments within the system. Currently the collection mechanism is cumbersome and does not work properly. In conclusion, the monitoring and tracking of the results and the improvement of the financial and budgetary performance of the administrative-territorial units obtained by the responsible central structures cannot be obtained. It requires serving as a monitor facility of the financial and budget performance indicators at the level of administrative-territorial units. For this area, the responsible institutions are the Ministry of Administration and Internal Affairs together with the Ministry of Public Finances. It also requires a set of relevant indicators that can create a picture of the current situation in an institution at some point, and the impact of the policies adopted on local levels. To fairly and efficiently substantiate the decisions taken at the central level, respectively the institution responsible - The Ministry of Administration and Internal Affairs - likewise other ministries, it is necessary to create a computer system and a national database for collecting, reporting, analyzing and publishing financial, non-financial data and relevant statistics regarding the performances of the local government administration. the poor quality of the analysis and studies carried out by the central and local government administrations, NGOs and civil society in matters of decentralization and local fiscal and budgetary policies, due to economic and financial data and information belonging to local government units, insufficient and irrelevant towards the government administration. The implementation of this project is strictly necessary, being prior to the commissioning and operation phase of the informational system and economical-financial database of the local government units – BDAPL necessary for the tests and studies that MAI still needs to perform (according to Law no. 273/2006 on local public finances) in order to express proposals for balancing the extent of amounts to be allocated annually from the state budget to local budgets, and how to share them to counties, and recommendations for improving the distribution system. Through this stage, the subsequently deployed activities will have a major impact in improving the efficiency of decision making both for the local and central government administrations. The need to implement the project is motivated by the assumption of the Romanian Government of the priorities to increase the administrative capacity, strengthening the fiscal and administrative decentralization process, the de-concentration and decentralization of services - areas that the proposed project supports. The need for this project, as part of the design and implementation of the informational system and the economical-financial database within the local government units – BDAPL was outlined during the consultations undertaken for the development of the decentralization Law no. 195/2006, Law no. 273/2006 regarding public finances, Fiscal Code and Fiscal Procedure Code and the modifications brought to Law no 215/2001 regarding the local government administration during the last three years, including the associated structures of the local government administration (The Romanian Municipalities Association (A.M.R. ), The Romanian Cities Association (A.O.R. ), The Romanian Communes Association (A.Co.R), The National Union of the County Councils from Romania (U.N.C.J.R. ), The Local Authorities Federation from Romania (F.A.L.R.) likewise the professional associations belonging to the specialists of the local government administration (The Economic Managers Association from within the Romanian County Councils (A.D.E.C.J.R. ), The National IT Association from within the Public Government Administration (A.N.I.A.P. ), The Economic Managers Department from within the Municipalities Association of Romania (C.D.E. from A.M.R.). The ultimate objective of the three projects consists in the implementation of a M.A.I. database containing economical-financial information for all the territorial government administrations and a relevant set of indicators. The database, including the indicators will be available on the M.A.I. site so that both the central government administration and the local government administration will be able to consult and will enable them to achieve the analysis and simulations that will shape the decisions to be adopted for the authorities of the local government administrations. The Tax and Budget Policies Department belonging to the Ministry of Administration and Internal Affairs, launched since October 1st, 2010 its own web page on the Ministry's site: http://www.dpfbl.mdrap.ro, and since October 14th, it will also launch the portal of the project http://www.bdapl.mdrap.ro.